In a previous AWS Security Blog post, Jeff Levine showed how you can monitor changes to your Amazon EC2 security groups. The methods he describes in that post are examples of detective controls, which can help you determine when changes are made to security controls on your AWS resources. In this post, I take that approach a step further by introducing an example of a responsive control, which you can use to automatically respond to a detected security event by applying a chosen security mitigation. 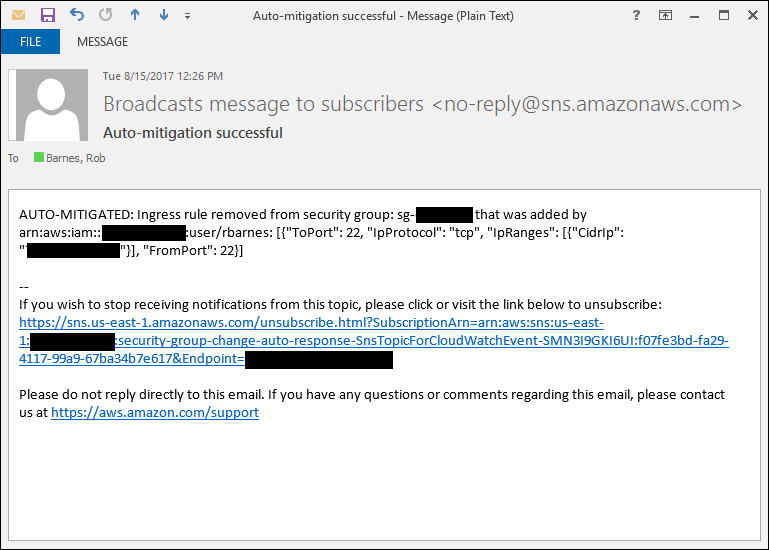 I demonstrate a solution that continuously monitors changes made to an Amazon VPC security group, and if a new ingress rule (the same as an inbound rule) is added to that security group, the solution removes the rule and then sends you a notification after the changes have been automatically reverted. Let’s say you want to reduce your infrastructure complexity by replacing your Secure Shell (SSH) bastion hosts with Amazon EC2 Systems Manager (SSM). SSM allows you to run commands on your hosts remotely, removing the need to manage bastion hosts or rely on SSH to execute commands. To support this objective, you must prevent your staff members from opening SSH ports to your web server’s Amazon VPC security group. If one of your staff members does modify the VPC security group to allow SSH access, you want the change to be automatically reverted and then receive a notification that the change to the security group was automatically reverted. If you are not yet familiar with security groups, see Security Groups for Your VPC before reading the rest of this post. This solution begins with a directive control to mandate that no web server should be accessible using SSH. The directive control is enforced using a preventive control, which is implemented using a security group rule that prevents ingress from port 22 (typically used for SSH). The detective control is a “listener” that identifies any changes made to your security group. Finally, the responsive control reverts changes made to the security group and then sends a notification of this security mitigation. The detective control, in this case, is an Amazon CloudWatch event that detects changes to your security group and triggers the responsive control, which in this case is an AWS Lambda function. I use AWS CloudFormation to simplify the deployment. The following diagram shows the architecture of this solution. Someone on your staff adds a new ingress rule to your security group. A CloudWatch event that continually monitors changes to your security groups detects the new ingress rule and invokes a designated Lambda function (with Lambda, you can run code without provisioning or managing servers). The Lambda function evaluates the event to determine whether you are monitoring this security group and reverts the new security group ingress rule. Finally, the Lambda function sends you an email to let you know what the change was, who made it, and that the change was reverted. In this section, you will click the Launch Stack button shown below to launch the CloudFormation stack and deploy the solution. You must have AWS CloudTrail already enabled in the AWS Region where you will be deploying the solution. CloudTrail lets you log, continuously monitor, and retain events related to API calls across your AWS infrastructure. See Getting Started with CloudTrail for more information. You must have a default VPC in the region in which you will be deploying the solution. AWS accounts have one default VPC per AWS Region. If you’ve deleted your VPC, see Creating a Default VPC to recreate it. A sample VPC security group in your default VPC, which is used as the target for reverting ingress rule changes. A CloudWatch event rule that monitors changes to your AWS infrastructure. A Lambda function that reverts changes to the security group and sends you email notifications. A permission that allows CloudWatch to invoke your Lambda function. An AWS Identity and Access Management (IAM) role with limited privileges that the Lambda function assumes when it is executed. An Amazon SNS topic to which the Lambda function publishes notifications. The link in this section uses the us-east-1 Region (the US East [N. Virginia] Region). Change the region if you want to use this solution in a different region. See Selecting a Region for more information about changing the region. To deploy the solution, click the following Launch Stack button to launch the stack. After you click the button, you must sign in to the AWS Management Console if you have not already done so. Choose Next to proceed to the Specify Details page. Choose Next until you get to the Review page, and then choose the I acknowledge that AWS CloudFormation might create IAM resources check box. This confirms that you are aware that the CloudFormation template includes an IAM resource. Choose Create. CloudFormation displays the stack status, CREATE_COMPLETE, when the stack has launched completely, which should take less than two minutes. Check your email for the SNS confirmation email. You must confirm this subscription to receive future notification emails. If you don’t confirm the subscription, your security group ingress rules still will be automatically reverted, but you will not receive notification emails. 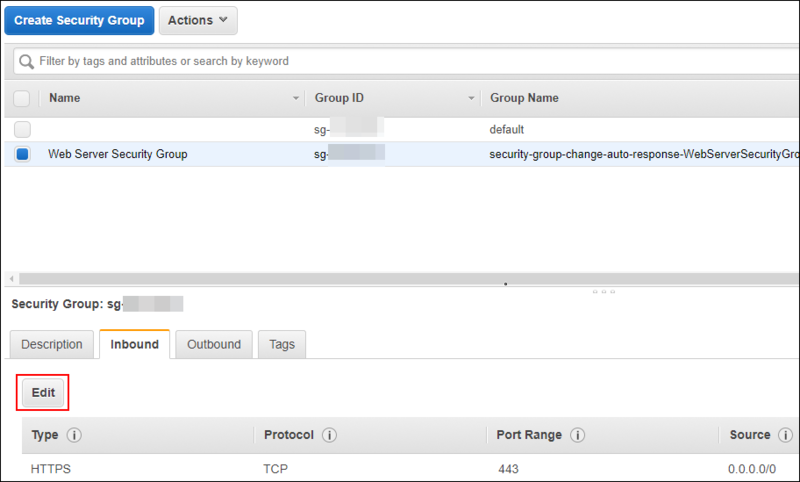 Navigate to the EC2 console and choose Security Groups in the navigation pane. Choose the security group created by CloudFormation. Its name is Web Server Security Group. Choose the Inbound tab in the bottom pane of the page. Note that only one rule allows HTTPS ingress on port 443 from 0.0.0.0/0 (from anywhere). Choose Edit to display the Edit inbound rules dialog box (again, an inbound rule and an ingress rule are the same thing). Choose SSH from the Type drop-down list. Choose My IP from the Source drop-down list. Your IP address is populated for you. By adding this rule, you are simulating one of your staff members violating your organization’s policy (in this blog post’s hypothetical example) against allowing SSH access to your EC2 servers. You are testing the solution created when you launched the CloudFormation stack in the previous section. The solution should remove this newly created SSH rule automatically. Adding this rule creates an EC2 AuthorizeSecurityGroupIngress service event, which triggers the Lambda function created in the CloudFormation stack. After a few moments, choose the refresh button ( ) to see that the new SSH ingress rule that you just created has been removed by the solution you deployed earlier with the CloudFormation stack. If the rule is still there, wait a few more moments and choose the refresh button again. You should also receive an email to notify you that the ingress rule was added and subsequently reverted. Choose the stack that you created earlier. Choose the Actions drop-down list. Choose Delete Stack, and then choose Yes, Delete. CloudFormation will display a status of DELETE_IN_PROGRESS while it deletes the resources created with the stack. After a few moments, the stack should no longer appear in the list of completed stacks. I have shown one way to use multiple AWS services to help continuously ensure that your security controls haven’t deviated from your security baseline. However, you also could use the CIS Amazon Web Services Foundations Benchmarks, for example, to establish a governance baseline across your AWS accounts and then use the principles in this blog post to automatically mitigate changes to that baseline. To scale this solution, you can create a framework that uses resource tags to identify particular resources for monitoring. You also can use a consolidated monitoring approach by using cross-account event delivery. See Sending and Receiving Events Between AWS Accounts for more information. You also can extend the principle of automatic mitigation to detect and revert changes to other resources such as IAM policies and Amazon S3 bucket policies. In this blog post, I demonstrated how you can automatically revert changes to a VPC security group and have a notification sent about the changes. You can use this solution in your own AWS accounts to enforce your security requirements continuously. If you have comments about this blog post or other ideas for ways to use this solution, submit a comment in the “Comments” section below. If you have implementation questions, start a new thread in the EC2 forum or contact AWS Support.